Containing good volume of copper , brass components get oxidized quickly in contact with moisture or air. To avoid oxidation of outer surface, nickel plating is widely used for brass components. 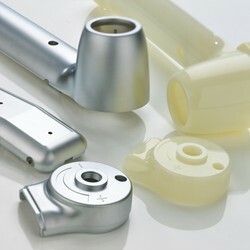 In case of special requirement of surface finish, we are open to offer. Eigen Engineering is one of the foremost exponents in providing plating services globally. We are proficient in all of the latest in plating methodologies and are also eco-pioneers implementing clean and environmentally friendly plating techniques. The nickel plating process is used extensively for decorative and engineering purposes because the appearance and other properties such as Hardness, strength, and ductility, Wear resistance, Load bearing characteristics, Corrosion resistance, Heat scaling resistance, Fretting resistance, and Fatigue resistance. Our organization falls under the category of prominent enterprise engaged in providing Zinc Nickel Plating Service. We are very well known in offering Titanium Nickel Plating services to our large client base. These plating services are done using 2 types of the metal polish. One is the titanium and the other is the Nickel. We assure timely completion of these titanium nickel platting services from our end to the client end.